Died: December 3, 1944; obituary published June 11, 1945 in the Hazleton Standard Speaker. Damiano Genetti, founder of the D. Genetti & Sons, operators of food establishments in Hazleton and vicinity, died in his native Tyrol to which he returned after retiring from his business enterprises in this city a number of years ago. His death occurred last December 3rd. A letter, telling of the passing of Mr. Genetti was written by a cousin who had taken care of him during his declining years. The letter was mailed by the Red Cross Feb. 3rd, of this year, and arrived in Hazleton on Saturday. The last message Mr. Genetti was able to get through war channels to this city was two years ago. It was a brief message through the Red Cross stating he was feeling fine and was all right. 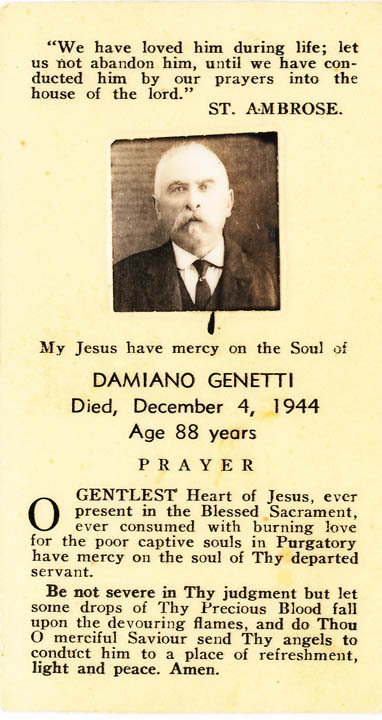 Prayer card for Damiano Genetti – courtesy of Jean Branz Daly. Jean’s mother was Erminia Genetti Branz, one of Damiano’s five daughters. Damiano Genetti was born in September, 1857, in Castelfondo, Trentino, Tyrol. He came to the United States in 1878 and settled at Lattimer. He worked as a mine tunnel contractor for the Coxe and Pardee mining interests. He ran the first rock tunnel drilled for Pardee’s at Lattimer. He married a girl from his native country, who also settled in Lattimer, the marriage being performed by Bishop O’Hara in Wilkes-Barre in 1886. His wife died in August, 1938. 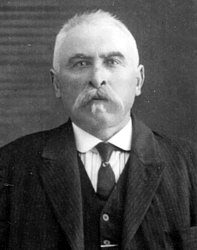 Mr. Genetti returned to Tyrol in 1887. He came to America again in 1901 and went into the meat business, locating on South Cedar Street. He first peddled meat from a wagon to housewives. In 1904 he opened his first store on South Cedar Street. In 1912 he moved his business to a new building he built on East Chapel Street. In 1913 he opened the first branch store of the firm on Hazleton Heights. In 1921 he retired, turning over the business to his sons. The sons continued to expand the business, the development leading up to the opening of the super market on North Laurel Street in September, 1939. Mr. Genetti is survived by the following sons and daughters: Leon A. Genetti, city; Mrs. Dora Bott, city; Mrs. Tillie Zambotti, Weston; August H. Genetti, city; Albert V. Genetti, city; Miss Esther Genetti, city; Mrs. Henry Branz, Freeland; Stanley V. Genetti, city; and Mrs. James McNelis, city. Also surviving are a brother, Ralph Genetti, Weston; and a sister, Mrs. Erma Recla, of Spokane, Washington. Thirty grandchildren and six great-grandchildren survive.